Advertise in our monthly newsletter. 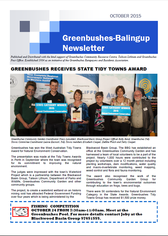 Distributed to Bridgetown, Greenbushes, Balingup, Mullalyup & Kirup. .
Noticeboards available at the Greenbushes CRC for any community advertisements you may want to display.